Uses the horse as ‘base machine’ for a wide range of applications. Horse logging can offer the appropriate power source, work on a variety of sites and allow a flexible, low impact method of work with high public acceptability. Horse powered timber extraction: Horse logging offers a contemporary, cost effective and cost competitive approach to timber extraction at low capital cost. Working on delicate, wet or steep sites or on short, small scale contracts alongside or completely replacing tractors and heavy equipment. Horse logging is a high quality silvicultural tool and contributes to selective and forest friendly management techniques. Horse loggers use a wide range of traditional and contemporary equipment as the product and site demands, from traditional ‘long’ or ‘trace’ gears with choker chains and skidding grapple through arches and sledges to specialised forwarding trailers. Working in establishment, first and subsequent thinnings and final crop, horses can be a complete solution to timber extraction needs. 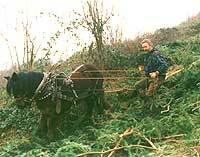 Mechanical Bracken Control: The Heavy Horses Bracken Basher offers a non chemical approach to the management of this pernicious weed. Optimum time for management is during June and July and repeat treatments are necessary for total eradication. Treatment by a horse logger is cost competitive and is not weather dependant. Treatment is possible in paddocks, woodlands and heathlands. 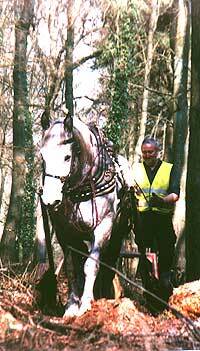 Scarification for natural regeneration: If management plans are to encourage natural regeneration, whether in heathland or woodland, the Heathland Rehabilitation Heavy Horse Harrow (HRH Horse Harrow), pulled by a working horse, will allow for effective harrowing on these difficult sites whilst dealing with stumps, rocks and brash. Mobile Saw Mill: A Woodmizer LT40 has recently been added to the range of equipment and enhances my ability to offer on site processing. Contracted in seperately or as part of a horse extraction service, mobile milling ensures that only valuable timber is removed from the wood, reducing costs and supporting sustainability. <<click here>> for more, but sadly out of date, 'news' and photos about horselogging contracts. show ring, static and working demonstrations of horse logging.